On Monday I went with Mrs Phillips and Izac from Pt. England School to the Pumphouse Theatre in Takapuna to see the HAIRY MACLARY SHOW. It was a good show and I liked it when Slinky Malinki was stealing things in the night. It was very funny when Scarface Claw got stuck up in a tree and all the people shouted and pointed at the tree. After the show we ate our lunch and then went to Takapuna Library and read some Hairy MacMaclary Books. When we left there we went to Takapuna Beach and saw a volcano called Rangitoto. On the way back to school we had a Happy Meal at McDonald's and played on a playground in a park. I enjoyed the day and liked meeting my new friend Izac because he wears hearing aids like me. On Thursday night we had a musical evening. I was excited and I was happy because my mum had put money in my shirt. I was wearing jeans, a shirt and a hat. My mum was cheering for me. I was in a group who was playing the bass. I was moving my arm out and in. I took my hat off my head. My mum said "Where is your $5?" It was in my pocket. My favourite part was Noisy Boys. I like Rolland because he was playing the bass. So first we were cheering for Rolland. Big Beat Box Boogie was a cool song. I like Big Beat Box Boogie, that is my favourite song. My favourite part was the Sister Act. I loved the Sister Act. My uncle had another concert. Last Thursday night Room 4 did a performance. It was amazing. First of all Saint Pius X all met in the school hall. Secondly our families came. "Room 4 will now do Beat Box Boogie" said Dorothy. "Come on everybody let's boogie" said Dorothy. Our leader was June. June said "Baa bu bu baa bu bu." My favourite part was hearing the Noisy Boys! Rollin was playing amazingly! I was really surprised. On Thursday night Dorothy said "Room 4 will sing The Beat Box Boogie." "
Thank you Room 4" said Angelica. I wore a skirt and a white t-shirt with black spots. When i was dancing my mum put 20 dollars on me. I was nervous because they were too many people. I was in the horn stabs. My mum was cheering for me. I saw my whole family and my Aunty. My dad was holding my baby brother. I like the Noisy Boy because I liked the way it was playing loud. I like Saveu's singing because she has got a beautiful voice. Most of all I liked the Noisy Boys. 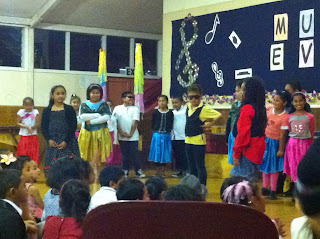 My favourite part was when i was dancing and singing to share our talents with our family and cousins. I moved my arms up and down, side to side. Everyone was clapping for Room 4. My Aunty was proud of me and my sister. June was nervous when she was singing in the microphone. I liked Room 6's band. We went back home. My mum gave me something. I liked the sausage sizzle. On Thursday night St Pius X had a musical evening. First of all Room 4 stood up on the stage. When I went up I saw some people, mums and dads and brothers and sisters too. When I was on stage I was nervous. My group was on the drums. Saveu had to sing and I had to dance. Motu's group was first. My group was third. After that Saveu had to sing again and then we all had to sing. At the end the Boys had to throw their hats off. My brother took a video. After that I went back home. My favourite part was when we did our parts together. On Tuesday 30th Room 4 was going a musical evening. When I got there I saw my friend. I went to Mrs Pole. "You look beautiful, " said Mrs Pole. I walked into the classroom. Mrs Pole said, "Here wear this skirt." I went into the hall with my class. We sat down on the mat. " Room 2 will start off with our prayer," said Lavinia. After Room 5 we were up next. I felt nervous at the start but when I gave the microphone to Motu I didn't feel nervous. I felt cool. "Thank you Room ," said Angelica. My favourite part was when I was singing a solo. After that when the musical evening was finished I went to my mum and my mum said, " When you were singing your dad said wow." I liked it when my mum gave me 5 dollars. On a hot Friday afternoon i was walking with my line to the red gate and waited for someone to say go. Miss G said "Get ready, get set, go!" When I ran past June she said, "I'm exhausted." When I ran past my mum I heard, "Come on, come on, my man!" to June. Then I stopped and went to my mum to get her pump because I couldn't breathe and I cried. I stayed with my mum for a little rest from running a long way. When I stayed with my mum, Jane said, "Josie I can't" and I cried. I went back to my line and watched the seniors have their cross country. Their cross country was around the streets and in the courts. My highlight is how I am happy that the cross country is over. On a hot summer's Friday afternoon we went to the starting line. I waited to hear the whistle. Miss G said "Get set, go!" I ran around the school. Parents were watching and so were the teachers and students. I felt nervous and excited. We ran two times. When we finished we went back to our age chair. Mrs Pole said "Good girl." We watched the seniors. I came fourth. What I didn't like was that I fell down. I felt tired when I ran. My highlight was when I ran around the school. Mrs Williams was looking for the winners. "Friday was the best day ever!" I shouted. We had cross country. I think this is our 1st or 2nd. "Nice" I said to myself. The seven year old's were ready to race. We line up in a straight line getting ready to run. When Mrs G said, "Ready, set,go!" We started to run like mad things. Marcus, Alan and I were tying. But I'd finished the whole race. Mrs Pole choose me to be first in the seven year old's. Mrs Koloti's sister said,"Wow!" I was proud of myself. Oh! iIforgot to talk about my favourite part. It was me coming first. On a hot, sunny Friday I felt excited. When Miss G said "Go!" I was waiting for Viane to get exhausted. My favourite part around the church. I tried my best, then I came fourth. I was proud I ran around the school. I had to do two laps. I felt happy and exhausted. I was so exhausted. It was fun. It was a fun day. On Friday afternoon I had cross country with my friends. I was tired when I ran in the race. Me and my friends had to go to the chairs. In the courts iI saw my parents and my baby brother and baby sister. I went around the hall and the church and the courts twice. I felt really tired and proud. On a hot Friday afternoon 8 year olds went to the start line. Mrs G said, "On your marks, get set, go!" Then I ran as fast as I could. I went past Paul. "Come on Paul ," I said. When I saw students in the courts I was nervous because I was coming fifth. I heard them cheer for me. When I passed Mrs Pole she said, "Run Stanley!" I ran around the Church then I went through the courts. I ran almost passed Fanoali'i but I'd fallen over. Mrs Bell picked me up and took me to the sick bay. Next she put on a plaster. Mrs Bell said ,"Do you want to stay here for a while?" "I do," I said. I was sad because I couldn't finish the race. Sarto was a Priest when he was 23. Italy was where Bepi was born. On the 22nd of June. Name was Guisepe Sarto and he was called Bepi for short. To walk bare feet to save his shoes. Pope Pius X, he loved Mass. In August 21st we celebrate Pope Pius X feast day. Usually only adults could take Holy Communion. Sadly he was sad to leave his family and village. X Pius died in 1914. Saint Pius X was born in Italy. Into a family who were very poor. Now he became a priest. To school Bepi carried his shoes on his shoulder. In a little village called Reise. Usually only adults took Holy Communion. Sarto was a Altar boy. X is the roman number for 10. Saint Pius X was named after Saint Pius X. Adults were only allowed to do Holy Communion. In 1914 St Pius X died. Now St Pius X was a priest. Then later in 1903 he was a Pope. Pope Pius died and people celebrated. In the 2nd of June St Pius X was born. Usually St Pius X was the big boss of the church. St Pius X was a holy boy. X is 10 - Saint Pius the X.
Saint Pius X was born in 1835. A man who loved God. Italy was where he was born. Next he became a priest. To school he walked with his shoes. In 1914 Pope Pius died. Usually only adults were allowed to make their first holy communion. Some people called Bepi, Sarta.